For construction company Dutco Balfour Beatty, a new 100-tonne capacity Liebherr HS 8100 HD duty-cycle crawler crane is saving the company time in Dubai. By powering its vibro hammer with the crane engine, the contractor reports a 20% increase in productivity improvements on the piling operations at a job at Expo Village in Dubai. The modification to the HS 8100 HD was engineered by Dutco Balfour Beatty and Liebherr Middle East FZE, and the duty-cycle crawler crane is using its engine power to drive the vibro hammer that installs pile casing. On the project, two 50-t capacity HS 8050 HD are used to install the steel cages, and a fourth Liebherr unit, an LR 1130 crawler crane with a maximum load capacity of 137 t, is also on site. DBB has six months to complete the piling and foundations work for its contract. 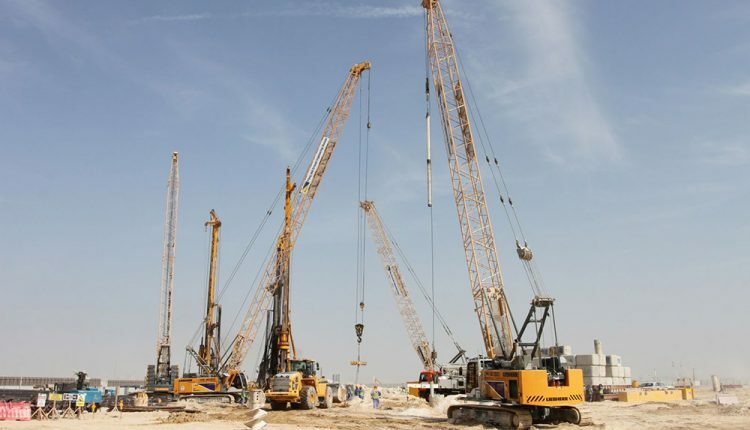 “We are well ahead of our schedule, and are set to complete the piling within four and a half months instead of six as per program,” says Tamer Shalash, DBB’s piling and ground engineering manager. “This is substantially due to a modification designed by ourselves and Liebherr, in which rather than installing a separate power pack on the crane to drive the vibro hammer, we are using the power of the crane engine. In this way, instead of using two engines to run the vibro hammer setup we have only one, and this is controlled by the crane operator”, says Ibrahim Hamdy, DBB’s plant and transport manager. The frame and power pack normally mounted on the crane is not needed, which Hamdy says saves on weight and increases maneuverability. “We do not need a separate operator for the power pack, so we save on manpower costs, and we save time because we eliminate the lost time required for communication between crane operator and vibro hammer operator,” he adds. Money is also saved on diesel and other operating costs. “Overall, we have calculated that in time, money, and efficiency, we have improved productivity by 20% if compared to the conventional two separate equipment of vibro hammer and crane setup. This is the first time this modification has been used in the UAE, and we shall be using this on the next project where we deploy the Liebherr duty cycle crawler cranes,” says Hamdy. Rotary drills are being used to bore the holes, with the Liebherr units driving the casing and then placing the steel rebar cage, in one length, into the hole. The contract requires 1,900 piles, ranging in depth between 15 and 26 m, and with diameters of 1,000 mm, 900 mm and 750 mm. The soil is sand for the first 4 m, with mixed rock of varying hardness below that, and a water table nearly 7 m below the surface. “The speed at which we are able to work has been significantly increased by operating the vibro hammer directly from the crane engine. We are working to a 24-hour cycle, and our highest rate of pile installation has been 43 piles during one cycle. Using this configuration, we are saving up to six minutes per pile. We are actually calculating that during one cycle we can save two or three hours. This is a real achievement, and we are very happy to have worked with Liebherr to arrange such a satisfactory performance,” Shalash says. Liebherr Middle East FZE, which is located in Dubai’s Jebel Ali Free Zone, delivered all four Liebherr cranes new for the project.